Spring is here, temperatures are warming, and juvenile salmon have filled the floodplains—a link for them between the gravel bedded rivers where they hatched and the ocean where they will spend the next one to five years. Although salmon may only use the floodplain for a month or two, this could mean the difference between success and failure in their long journey to the ocean and back again. When juvenile salmon spend time on the floodplain, they grow faster than those that use only the river channel during their migration to the ocean (Sommer et al. 2001, Jeffres et al. 2006). Because of the increased growth, the juveniles are larger when they head out to sea; they can survive better by swimming faster and being more able to avoid predators. What makes a floodplain a good place for rearing salmon? First of all, it needs to be connected to the river. This sounds obvious, but most of the floodplain habitat in California is isolated behind levees and only gets flooded during extreme high water events when the levees are overtopped or breached. The reason that the levees are there is to protect housing and agricultural land (orchards, vineyards, etc. ), which doesn’t allow for regular inundation of floodwaters. Despite these challenges, some floodplains are still active in California and studies of these active floodplains are changing our minds about their value. Multi-purpose floodplains such as the Yolo Bypass and Cosumnes River Preserve, for example, provide flood protection, seasonal agricultural land for annual crops, and restored habitat for many species, not just salmon. Why are these multi-purpose floodplains better than the river channel for rearing salmon? 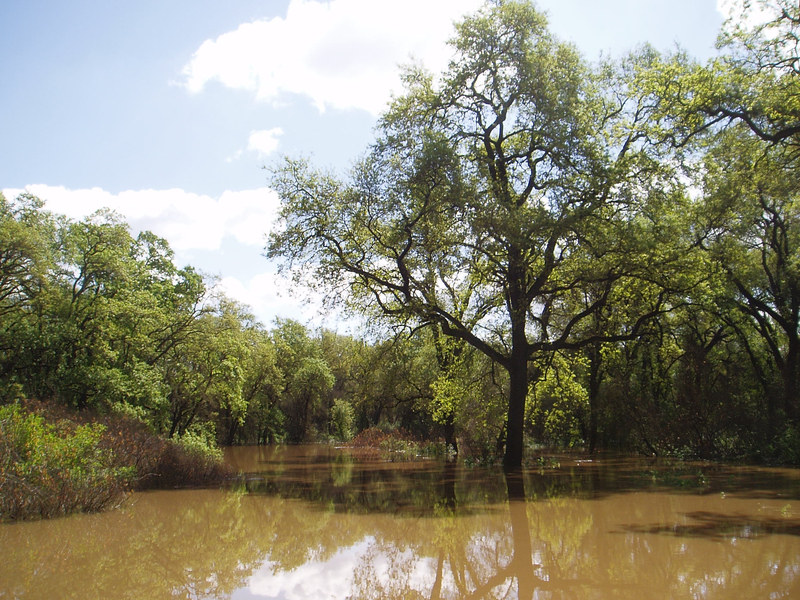 As cold floodwater enters a floodplain from the river, it spreads out, slows down and deposits sediment. Throughout this process, the water also warms slightly. This is essentially the priming of the productivity pump that will ultimately feed the juvenile salmon for the next couple of months. As the water slows, clears and warms, phytoplankton and algae begin to grow. Populations of animals that feed on the fast-growing plant life, such as zooplankton and other aquatic invertebrates boom. These animals comprise the main food of juvenile salmon on the floodplains. Because salmon are cold blooded, water temperature it is an important component to floodplain suitability. 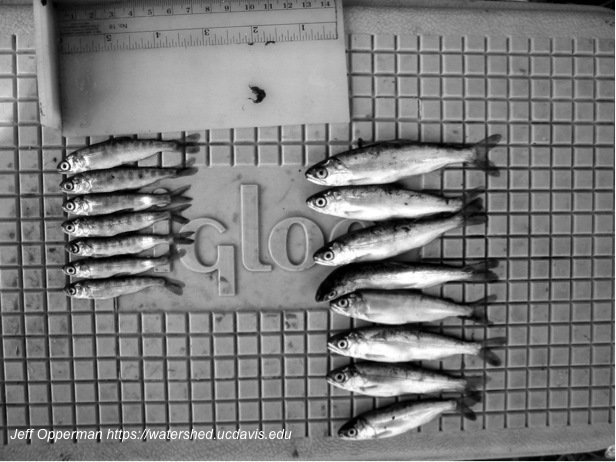 If water is too cold, juvenile salmon are lethargic and growth is slow. If the water is too warm it causes increased metabolic demands and reduced dissolved oxygen, inhibiting growth and increasing mortality. Fortunately for California salmonids, out-migration is in the spring when temperatures are generally moderate. The timing of spring high flows onto floodplains allows for ideal temperatures for juvenile salmonids compared to the relatively cold water in the main river channel. When temperatures are good and food is abundant, juvenile salmon can grow at impressively fast rates, especially when compared to fish using the main river channel. The combination of complex physical processes and ecological function is what separates the floodplain from the river corridor in the eyes of juvenile salmon. Leveed river channels provide little complexity and less than ideal growing conditions during the annual spring out-migration. When juvenile salmon have access to complex floodplain habitats where temperatures are good and food resources are abundant, they will grow to larger sizes and thus be able to survive better than fish that remained in the main river channel. So, next time you catch a big healthy salmon, thank your local floodplain. Jeffres, C., J. Opperman and P. Moyle (2008), “Ephemeral floodplain habitats provide best growth conditions for juvenile Chinook salmon in a California river,” Environmental Biology of Fishes 83 (4): 449-458. Sommer, T., B. Harrell, M. Nobriga, R. Brown, P. Moyle, W. Kimmerer and L. Schemel (2001), “California’s Yolo Bypass: Evidence that flood control can be compatible with fisheries, wetlands, wildlife and agriculture,” Fisheries 26 (8): 6-16. This entry was posted in California Water, Fish, Floodplains and tagged Chinook salmon, Cosumnes River, floodplain, floodwaters, habitat, UC Davis Center for Watershed Sciences. Bookmark the permalink.